The space shuttle Discovery is shown docked with the International Space Station on Feb. 26, 2011 shortly after its arrival. A camera on the station's exterior caught this view. HOUSTON – Amid the flurry of settling in to life onboard the International Space Station, astronauts on the space shuttle Discovery's mission have taken time to contemplate the significance of this shuttle's historic final flight. Discovery arrived at the space station yesterday (Feb. 26) for one last visit before the shuttle is retired from service at the end of this mission. The six astronauts who are flying the orbiter on its final flight are veteran spaceflyers, including several astronauts who have completed long duration stays at the massive orbiting laboratory. "I spent six and a half months here in 2009, and I loved it up here – I didn't want to leave," mission specialist Michael Barratt told reporters today in a press briefing from the station. "For me, the mission has a lot of meaning. It's a return." On its 11-day mission, Discovery is also delivering spare parts, an outdoor storage pallet, a humanoid robot assistant, and a much-needed storage module to the station. This storage module, akin to a big space closet, will be the final U.S. addition to the fully constructed station. In its 27-year spaceflying career, Discovery has docked to the space station 13 times. This stay will be its last. The significance of the milestone is not lost on the shuttle's crewmembers, but for now, they remain focused on the mission, STS-133 commander Steve Lindsey said. "The truth is, once we get close to the launch countdown, we're not thinking about Discovery's last flight, we're thinking about doing out jobs," Lindsey said today. "But it's a real privilege to be on the last flight of Discovery. I've flown her three times now, and she's a great vehicle still." Just before Discovery linked up with the space station, Lindsey and pilot Eric Boe maneuvered the spacecraft through a slow 360-degree back flip, 600 feet (183 meters) beneath the station. This flip is done to allow astronauts on the space station to take high-resolution pictures of the shuttle's tile-covered backside. The images are used to closely inspect the shuttle's heat shield for any damage it may have incurred during launch, ascent and the time spent in orbit. Discovery was the first shuttle to perform this maneuver, on its STS-114 mission in 2005. NASA made the backflip a mandatory part of all shuttle missions following the 2003 loss of the shuttle Columbia and its crew due after that orbiter's heat shield was damaged, causing the shuttle to break apart upon reentering the Earth's atmosphere. Mission managers have not yet fully analyzed the photos of Discovery's heat shield from this mission, but based on preliminary data, officials say the orbiter looks like it's in good shape. The mission timeline allows for a follow-up inspection later on during the mission to gather more photos from potential problem areas, but officials said today that another inspection would not be necessary. As Discovery turned nose cap over tail for the final time yesterday, Boe reflected on the incredible views of the completed station from the windows of his spacecraft. "You get some really good views from the space shuttle," Boe said. "It's truly a sight to see, and when you add in the effect that you have the Earth going on underneath you, it's really amazing." At the conclusion of the STS-133 mission, NASA will retire Discovery, the agency's oldest and most-flown spacecraft. The remaining two shuttles in the fleet, Endeavour and Atlantis, are each scheduled to fly their final missions later this year – Endeavour in April, and Atlantis in June. NASA is ending its space shuttle program to focus on exploration missions that extend farther out into the solar system, with objectives that include visiting an asteroid and eventually Mars. But, the retirement of the space shuttles will likely be a bittersweet end of an era. "I think the unique thing about the shuttle is its ability to carry large payloads and people into space and back," Lindsey said. "It's been a workhorse for nearly 30 years now. It can do everything you can think of in space, and it lands on a runway. The class of spacecraft we'll see in the future – it'll be a long, long time before we see something that can lift and do everything the shuttle can." You can follow SPACE.com Staff Writer Denise Chow on Twitter @denisechow as she covers Discovery's final space voyage from NASA's Johnson Space Center in Houston. 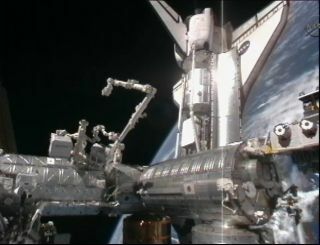 Visit SPACE.com for complete coverage of Discovery's final mission STS-133.